I'm just back from a bike trip to Tuscany and trying to remember the wonderful food, sublime landscapes and grand gardens in between coping with the worst stomach bug I've had since I was laid out for 72 hours in India a few years ago. I've no idea what it was - too much excercise maybe, those hill towns are a long way up; too rich food, that cucina povera is anything but bland; or was it that fountain I drank from.........?Who knows. Anyway, before I'm forced to leave the keyboard here are a few more photographs. For an area overwritten, overfilmed and overrun by Brits, Americans and general tourism (and I plead guilty on several counts ), there are still some fine places. Just don't expect to be on your own. The first two are from the Botanic Gardens in Siena - a calm retreat for a few hours in a town that seems to have a flag waving party for any reason - like it's Tuesday or Wednesday or we won the Palio. And these are from La Foce, the estate of the late Iris Origo in the Val d'Orcia - she's written an excellent account of her WW II years here hiding POWs, rescuing displaced children and generally turning around land holding and agricultural practice in what is a barren and harsh landscape. 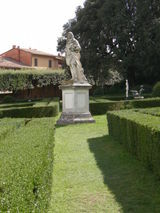 And one from Horti Leoninni in San Quirico d'Orcia, a 16th century Italinate garden right in the centre of town. Sorry to hear about the stomach ailment, but the pics are beautiful. I'm for maintaining about a 5:1 ratio of British to Americans in Tuscany, my countrymen mean well; but if they achieve a majority they will start hollering for wider roads and "real" Italian food like they get at home in North Dakota. I just adore the botanic gardens in Siena. It's such a haven, it seems that no one knows about it, you hardly run into anyone else when you're there. Not seen any of the other gardens but have you been to the one in Florence? Um, the name of it escapes me at the moment but it's huge with a massive house, and it's just accross the river... sorry, I'm rubbish. But it's very nice.. I've a great affection for the country and the people - lived there for a number of years and my wife's American but you're a native and can say it!!!! Reminds me of the couple comparing gelatos in Montalcino with what they could get at home - in Chuckwagon - Colorado Springs. Best food of the trip - pureed asparagus crositini in a paper table cloth osteria in Montalcino; grilled Tuscan sauages (small, squat and fat, probably 100% meat, wild boar, dark and rich, no padding or rusk so even though they were small there was plenty of eating)with puree di patata (50% butter at least! )and a side of spinach with garlic.Oh yes and any of the pici dishes - the anchovy and tomato sauce was delicious! Yep. There was no one visiting when we were there but the visitor book had a fair number of entries. I always try to make a point of finding out if a city has a botanic garden. 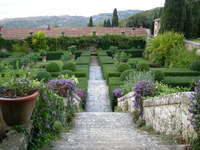 Haven't been to Florence yet - are you thinking of Boboli Gardens or the Fiesole? Last year I biked around the Umbrian hill towns - Asissi, Spoleto etc - a doddle really but Tuscan hill towns are something else. I should have been warned - they are hill towns in the hills! Montalcino was the worst - the last 1k or so saw us climb over 1500feet; that's when we queried the nature of a cycling holiday! NLP is much in vogue with management consultants and HR departments as a means of identifying success and talent. Of course it's attractive to them as it turns human relations into a 'process' which can be 'quantified'. Spent a lot of time on the trip looking up at balconies! thanks for the lovely pictures. 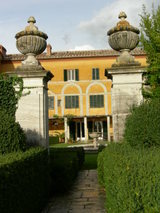 It may be that Tuscany is so popular because it is a part of our Western cultural and historical "roots". I hope to make a pilgrimage there someday myself.